On this special day I can't help but thank God for my many blessings. The dear friends that he has given me, the incredible family I was born with and married into, and then of course my precious baby girl. This has been one crazy year full of morning sickness, sleepless nights, excitement, anticipation and pure joy. It has been a year I will never forget and always cherish. As I reflect over the last 12 months I can't help but smile. I can honestly say that my life feels more complete than ever before. Sure I have always had a "purpose" in my life. My number one purpose is to live my life for the Lord, "To know God and make Him known". 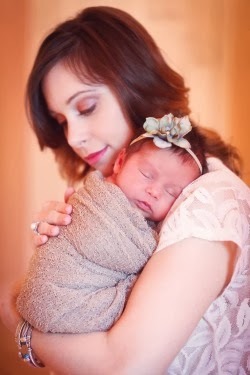 But having Josselyn has given me another wonderful purpose and that is motherhood. I now have this little innocent child that I am completely responsible for. It is up to me to protect her, care for her and teach her how to dream and be a world changer. It's hard to believe it, but this little baby has really given my life a new meaning, and I thank God for it. I know that John and I have been a "family" since we got married in 2006 but ever since Josselyn came along we really feel like a family now. I guess having 3 of us makes all the difference :) Basically, I love this new feeling of having our own little family! So all in all, Josselyn has changed my life for the absolute better! Sure I am now accustom to sleepless nights and I have no choice but to think of baby spit up and drool as an accessory, but I wouldn't trade it for the world! It may have taken me 4 trips to the mall instead of 1 to do all my Christmas shopping (it doesn't help that I have to stop and feed my daughter every 3 hrs because she still won't take a bottle!) but you know what, Josse is worth every ounce of the inconvenience I face. I have learned that the saying "a baby changes everything" is completely true! But I love the beautiful new changes in my life! Speaking of babies changing everything...there was one baby that came into this world and changed it for eternity. During this special day, I can't help but be reminded of the absolute most precious gift of all...Jesus Christ. Our savior came into this world so gracefully and so humbly. 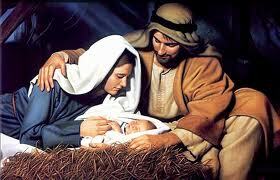 The King of Kings came into this world as the son of a peasant woman and a carpenter. He could have been born in a lavish castle with maids and servants but instead he was born in a stable. He could have been wrapped in the finest silks and robes but instead he was wrapped in swaddling clothes and laid in a manager (a feeding trough). He came solely as an atonement gift for you and me. And for that I am eternally grateful.